Let the collections at Sea Fortress Suomenlinna and Museum of Contemporary Art Kiasma capture your imagination. Get some cultural insight at Rock Church and Helsinki Cathedral. 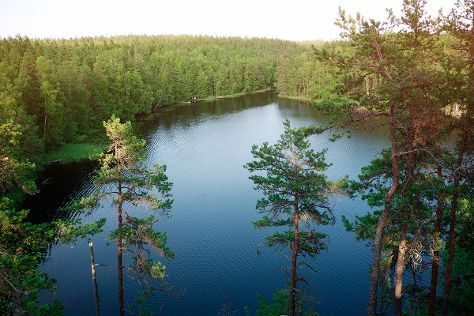 Change things up with these side-trips from Helsinki: Espoo (Nuuksio National Park & Kaitalampi) and Sipoonkorven Kansallispuisto (in Vantaa). There's still lots to do: take in the spiritual surroundings of Uspenskin Cathedral (Uspenskin Katedraali), meet the residents at Korkeasaari Zoo, take an in-depth tour of Seurasaari Island and Open-Air Museum, and make a trip to Senate Square. To see maps, photos, other places to visit, and more tourist information, you can read our Helsinki itinerary planner . Hamburg, Germany to Helsinki is an approximately 5-hour flight. You can also do a combination of flight and ferry; or drive. Due to the time zone difference, you'll lose 1 hour traveling from Hamburg to Helsinki. In July, plan for daily highs up to 25°C, and evening lows to 15°C. Finish your sightseeing early on the 20th (Sat) to allow enough time to travel back home.